Evergreen shrub or tree 3–12 m tall, usually single-stemmed. Bark and wood unknown, sap colourless; ultimate branchlets terete, 0.7–1.5 mm wide, greyish brown, pubescent, becoming puberulous; bud-scales caducous, triangular, ± 2 mm long, puberulous. Leaf-blade oblanceolate, rarely narrowly elliptic, 1.9–10(–12) cm long, 0.7–3.6(–4.5) cm wide, apex bluntly acuminate, the acumen ± 1 cm long, base cuneate to acute with convex sides, (7–)8–9 pairs of main veins, leathery, glabrous, dark green drying grey green. Petiole terete, 1.5–17(–32) mm long, ± 1 mm wide, puberulous to scurfily brown or grey pubescent when young. 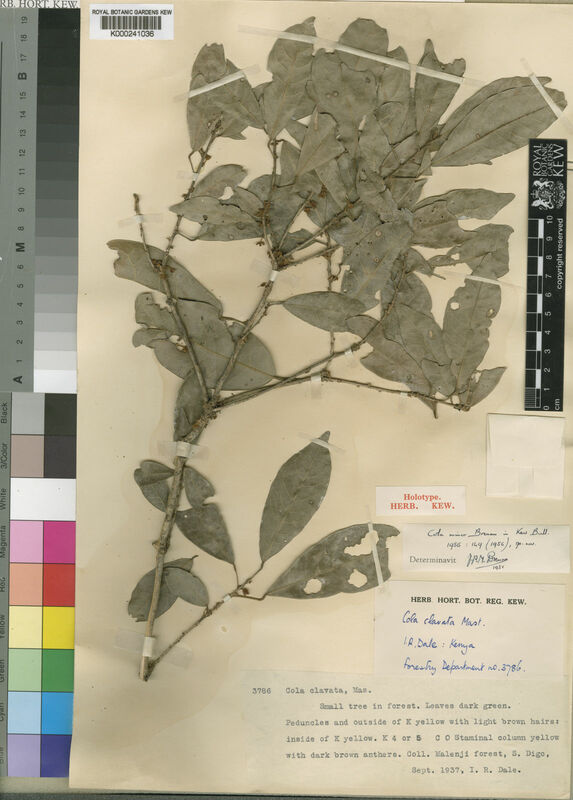 Of the 12 specimens known to me of this species, only one is from Tanzania, the remainder being from K 7. It is limited to the severely fragmented remnants of coastal forest, now threatened by clearance. I estimate the area of occurrence of this species to be less than 2000 km2. Accordingly, C. minor is here assessed as VU B2a, b(iii), that is vulnerable. Sometimes confused with Cola pseudoclavata which shares the same habitat and, occasionally, location. C. minor is distinguishable from C. pseudoclavata by its constantly shorter petioles (up to 17(–32) mm long) and dark green uniformly smaller (to 10(–12) cm long) leaf-blades with 8–9 pairs of nerves. 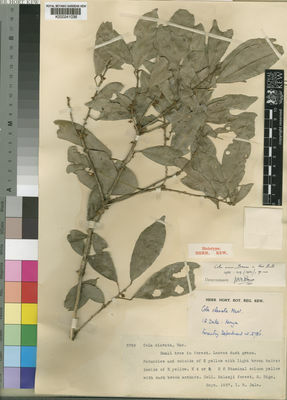 All specimens of C. pseudoclavata have petioles up to 50(–60) mm long and yellowish-green leaf-blades with a greater range in size (to 17 cm long) and 5–7(–8) pairs of nerves. C. minor is only known from 10 fertile collections. On present evidence it appears dioecious.